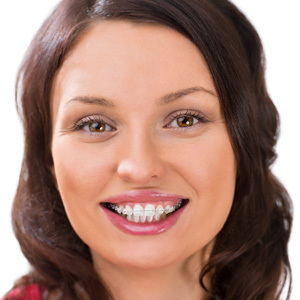 Just like traditional braces, clear ceramic braces feature two important components: First, a clear or tooth-colored bracket is attached to each tooth. Next, we thread a wire through the brackets. The brackets may be made of a variety of ceramic and composite materials, but you will usually hear us refer to them as “ceramic”. Soreness is normal for 2 days following the placement of new braces and adjustment appointments. Gargling with warm salt water and over-the-counter pain medications can help to relieve soreness. Braces and wires should be brushed at least 2 times a day and flossed every night before bed.